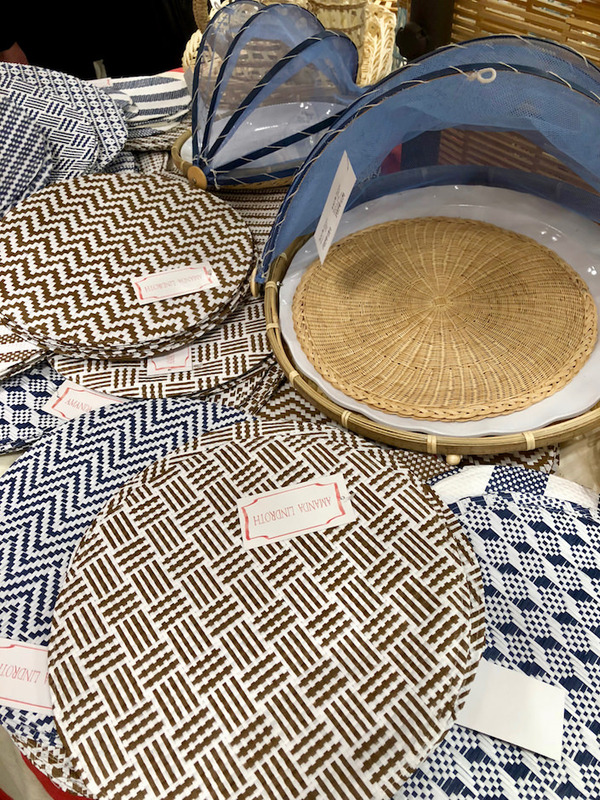 You have probably seen Amanda Lindroth‘s island inspired products – they have been a hit every since she launched the line (you may remember seeing my fun summer bags here and here). 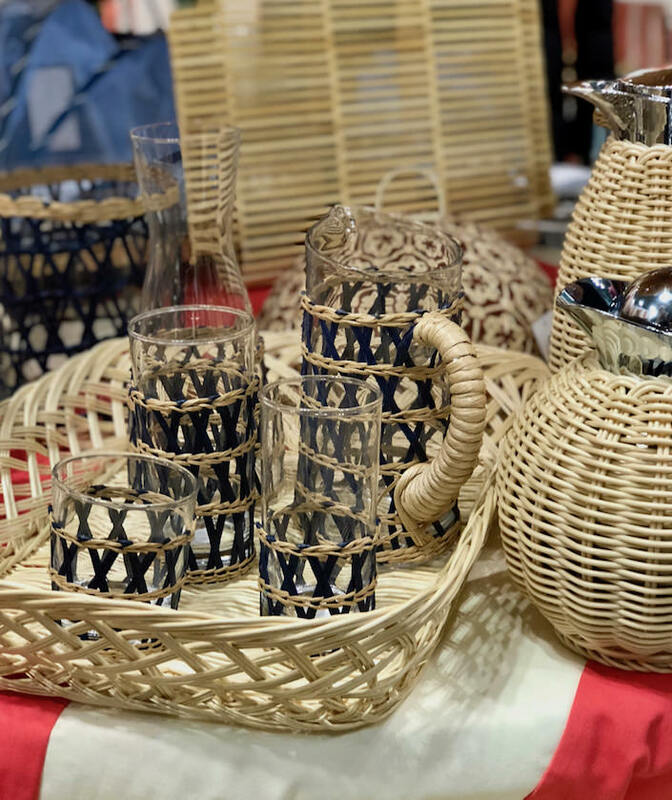 Her booth was hopping with tons of interest for Lindroth Design’s Bahamian chic style. 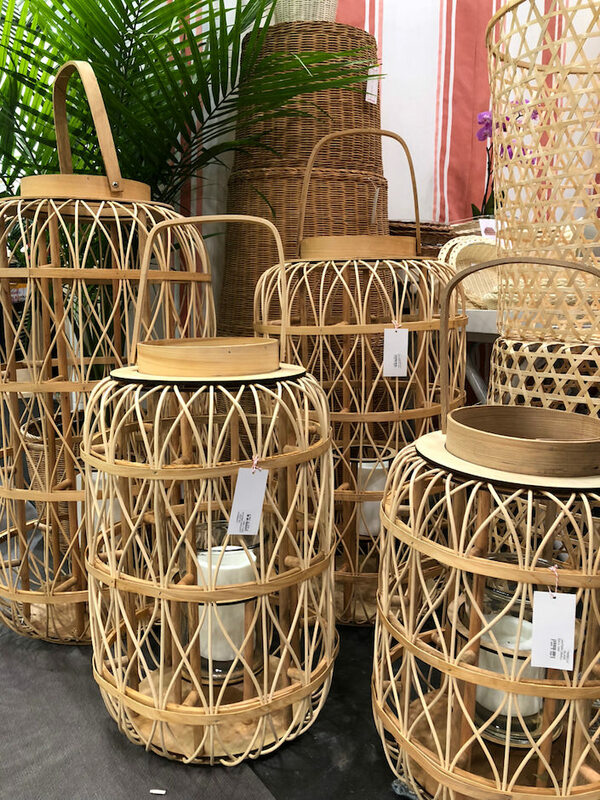 These Harbour Island rattan and wood lanterns come in a variety of sizes and look great single or grouped. For smaller lighting opportunities, there are her hurricanes. 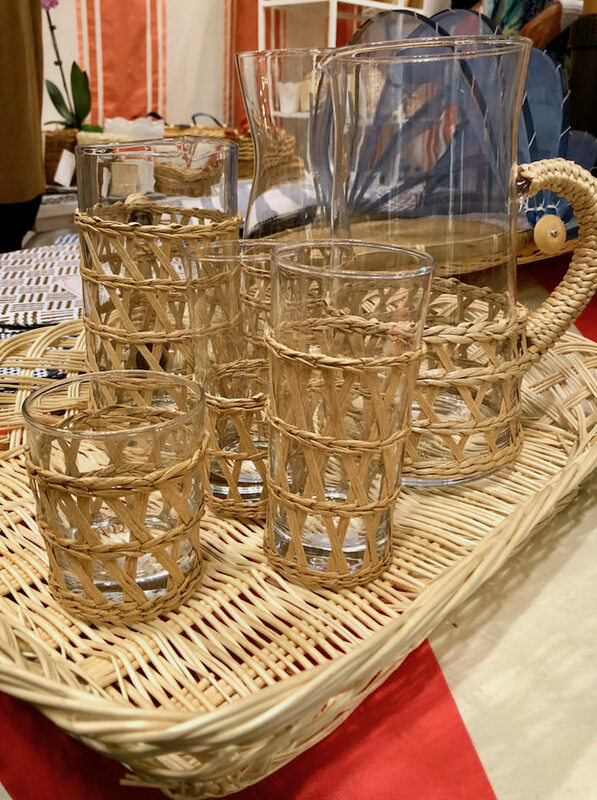 Her seagrass covered glasses and pitcher, above, are perfect for spring/summer entertaining and now come in a range of colors. 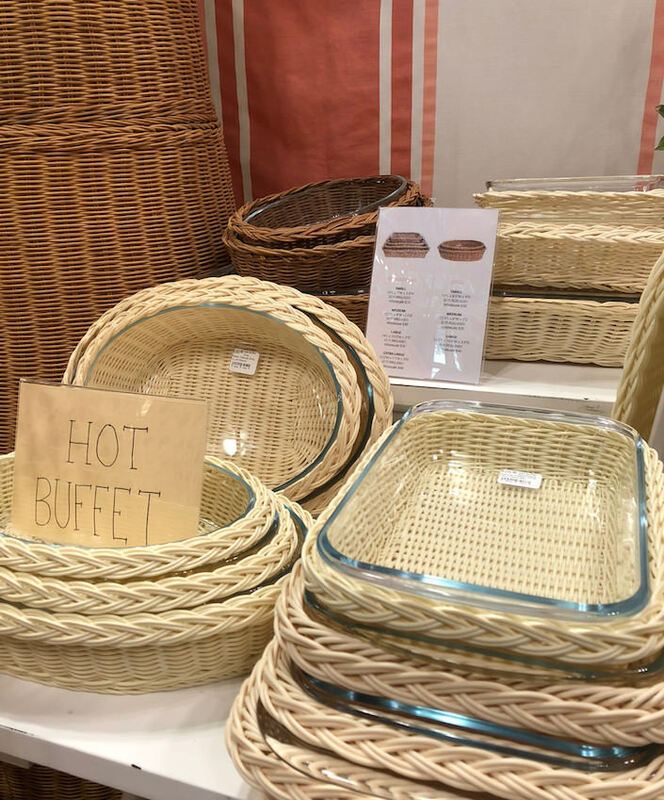 wipeable placemats and picnic tent with melamine dish. 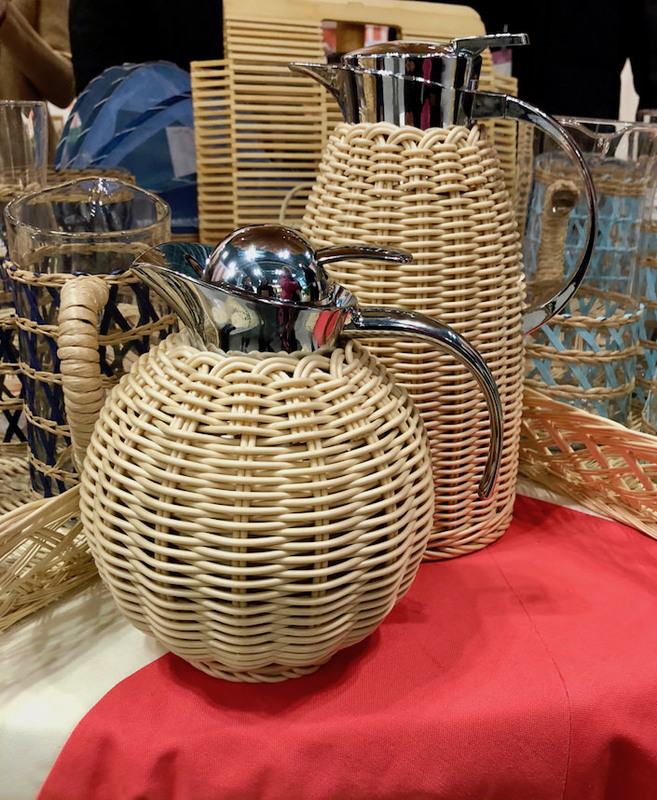 And these wicker covered thermoses are a fantastic hostess gift and would be a much appreciated accessory in any guest room. And I have to thank Amanda for my next find – Business & Pleasure. This young Australian company has come up with such clever and beautiful beach focused products. Their beach tents are UV protected, water resistant, great looking and most importantly, easy to assemble. Oh and did I mention it is all collapsible and folds up into a convenient carrying bag? They also make a range of retro chic umbrellas of UV water and mold resistant canvas. 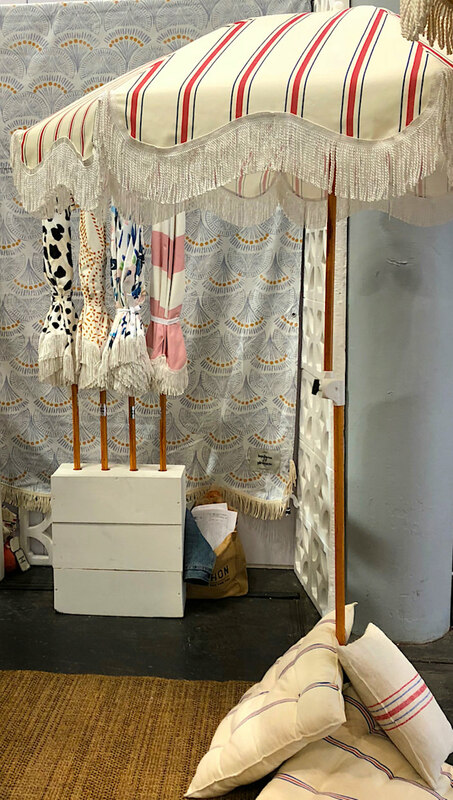 The wood poles are eco friendly (they use a World Forestries certified producer) and the trim is of all natural unbleached cotton. The umbrellas also come with carryable pouches and a full one year replacement warranty of parts and assembly! I was delighted to finally meet the ladies from Serendipity Delhi in person. 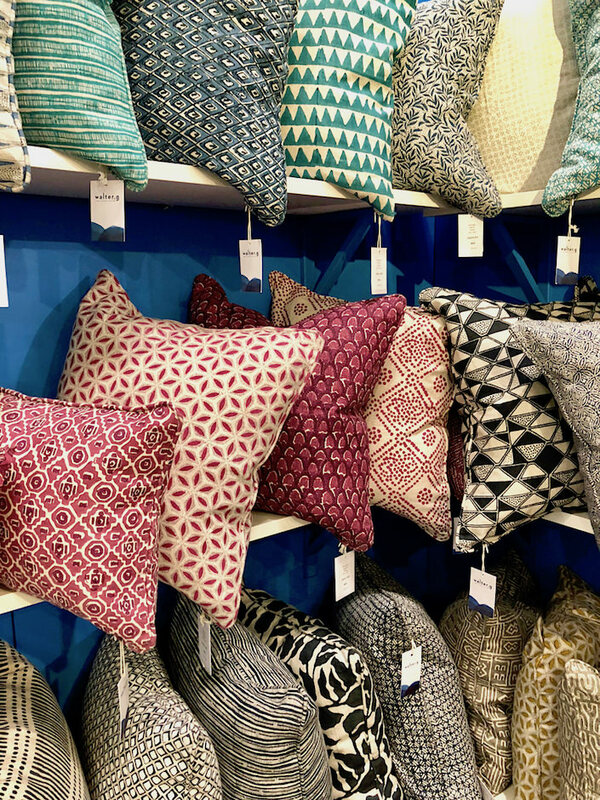 With an acclaimed lifestyle concept store in Delhi, founder and designer Kuldeep Kaur has been designing home textiles and furniture for over 20 years. 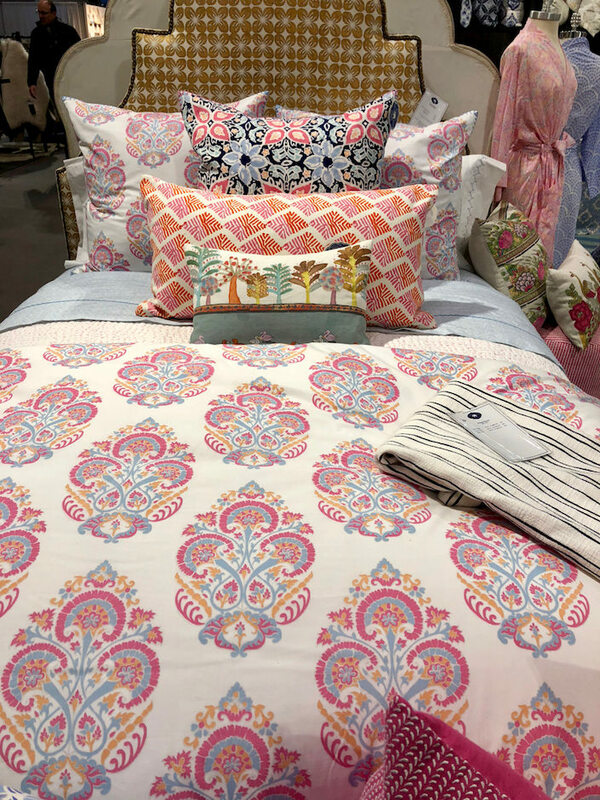 Her beautiful artisanal products, such as the hand stitched quilts above, or colorful coverlets below, inspired by traditional Indian design, are fresh and easy to mix with other styles. 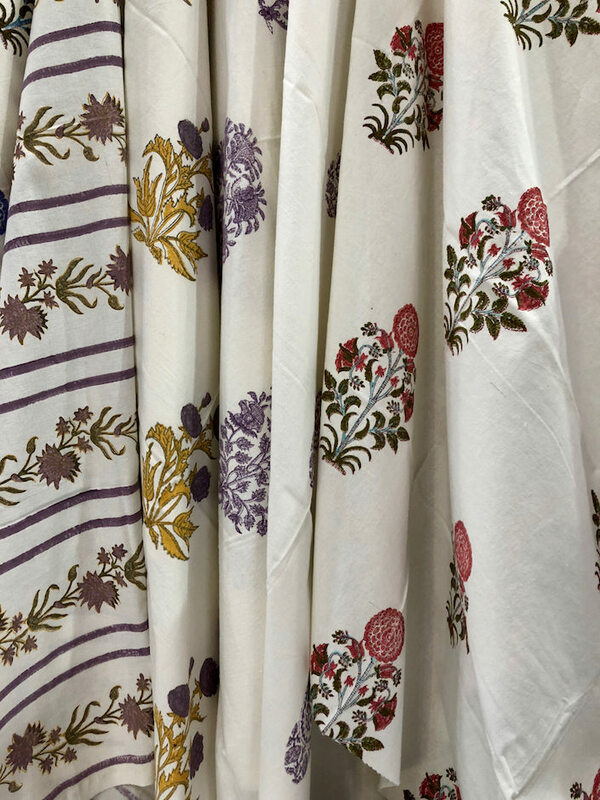 and they are now also producing block print fabrics sold by the yard. 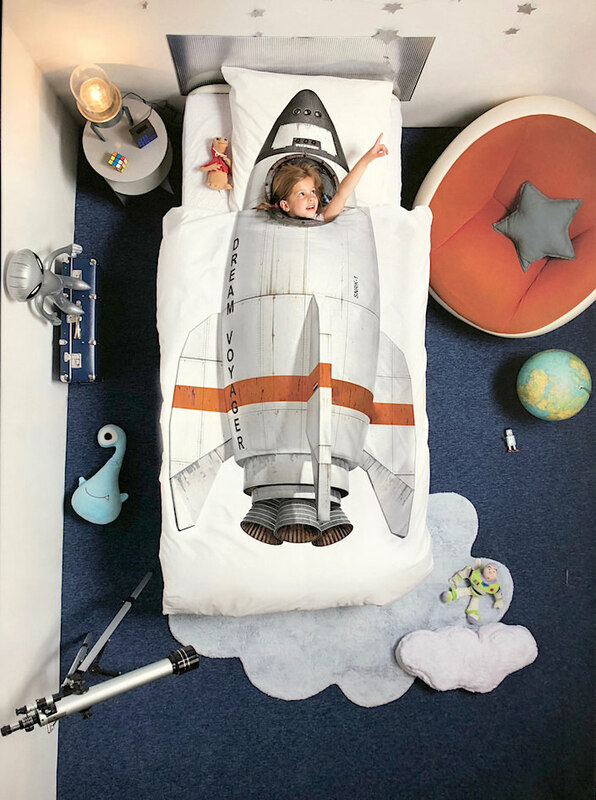 I don’t search out many children’s products but this fun bedding from Amsterdam based company SNURK (Dutch for snore) was hard to miss. are bold, fun, clever and new to the US last year! 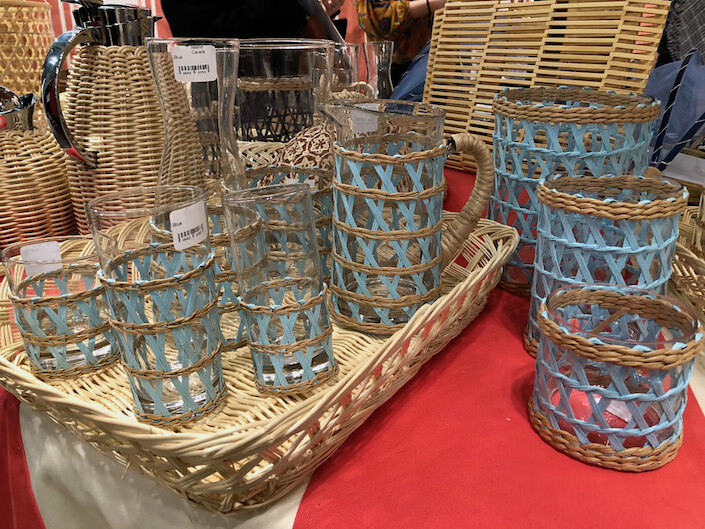 Matouk is always a stop for me at the show. Their spring collection includes a new colorway, Tigereye, for the popular Lulu DK pattern Poppy, shown with their new stone washed matelassé Costa and peeking out of the top corner, the new feathery Atoll. 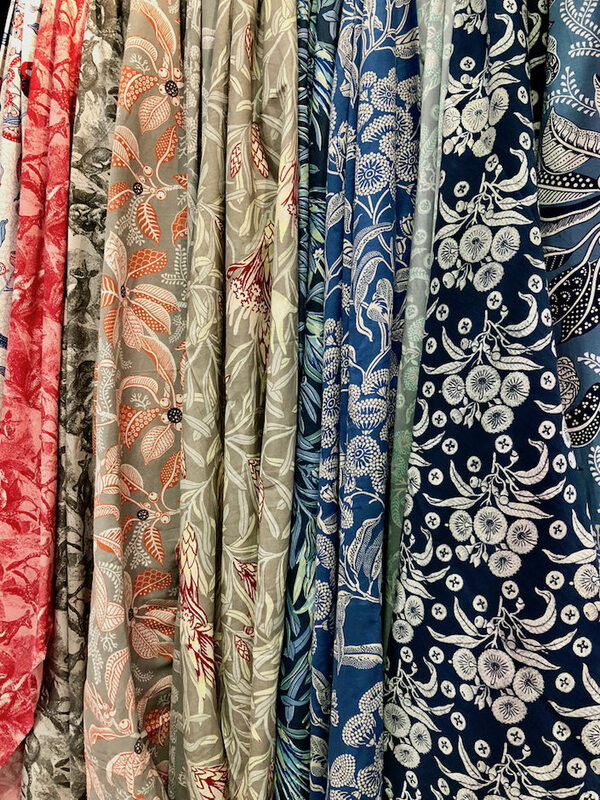 A new Lulu DK pattern, inspired by the plants around her Lyford Cay home, is Palmyra, printed on a featherweight cotton voile. 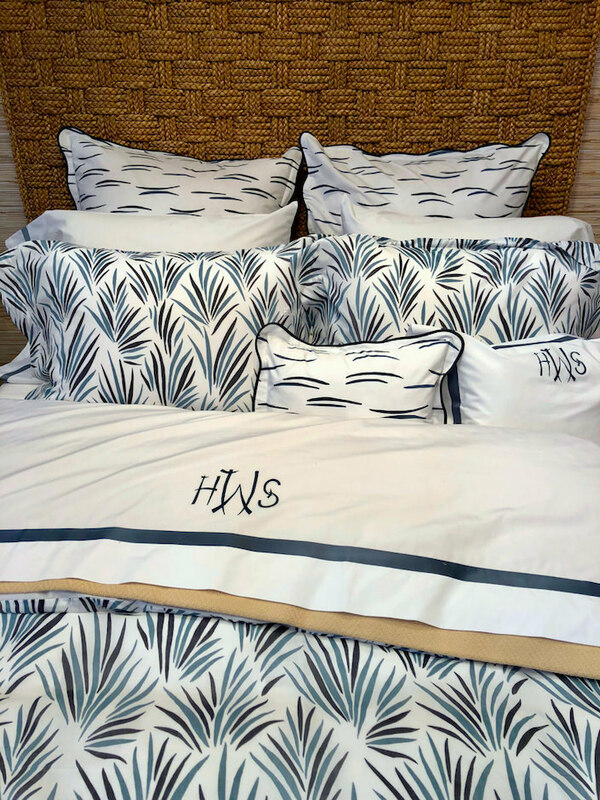 It is shown with scallop edged pillows in Matouk’s new graphic Malibu. 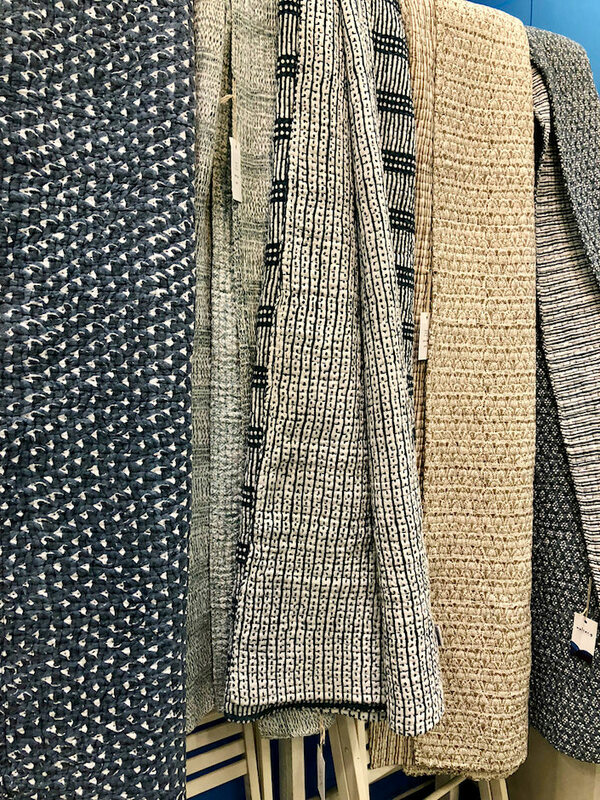 The new Havana is a beautiful stonewashed, yard-dyed basketweave linen that is sophisticated enough to be dressed up yet perfectly casual for beach or country setting. 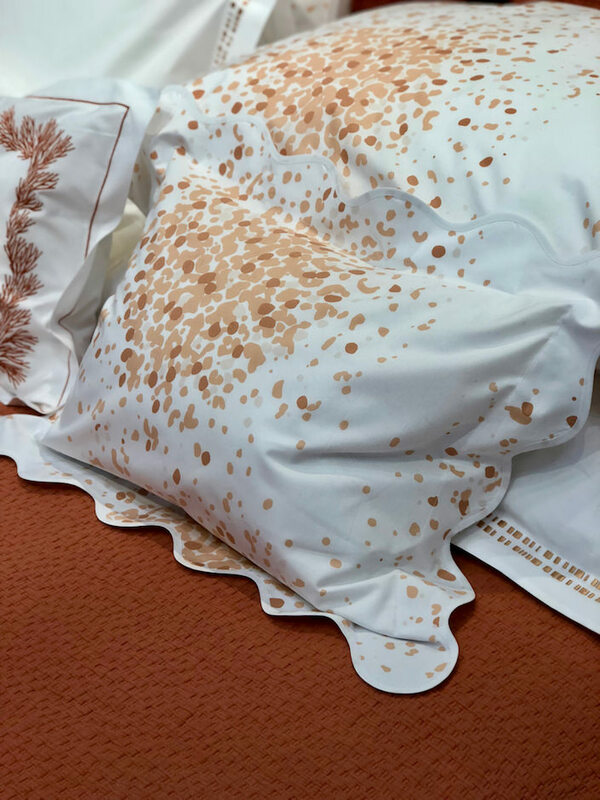 It’s shown below with new Tangier, a graphic embroidery with exotic hint. 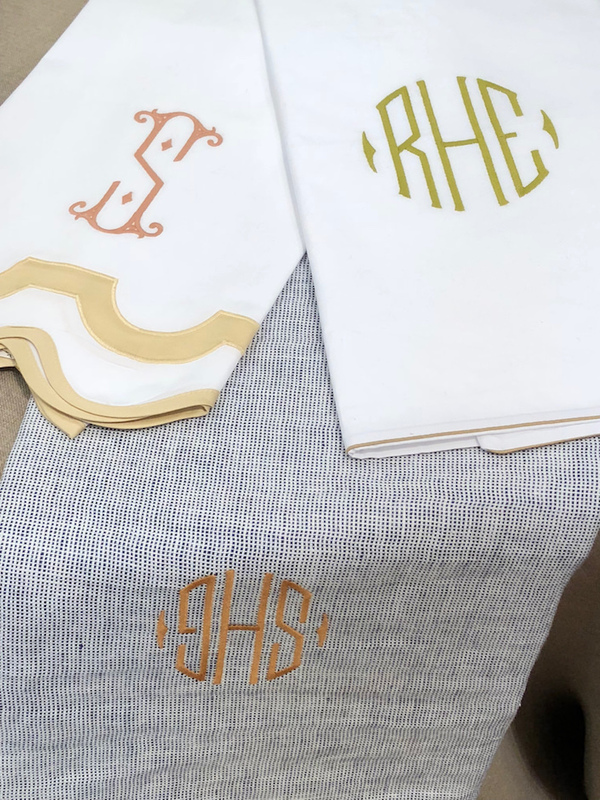 and a new quick ship monogram service for both tabletop and bedding, which is now delivered in half the time – 2 weeks for the monograms below on in-stock merchandise! John Robshaw is also a perennial stop with his always colorful boemian chic pattern play. 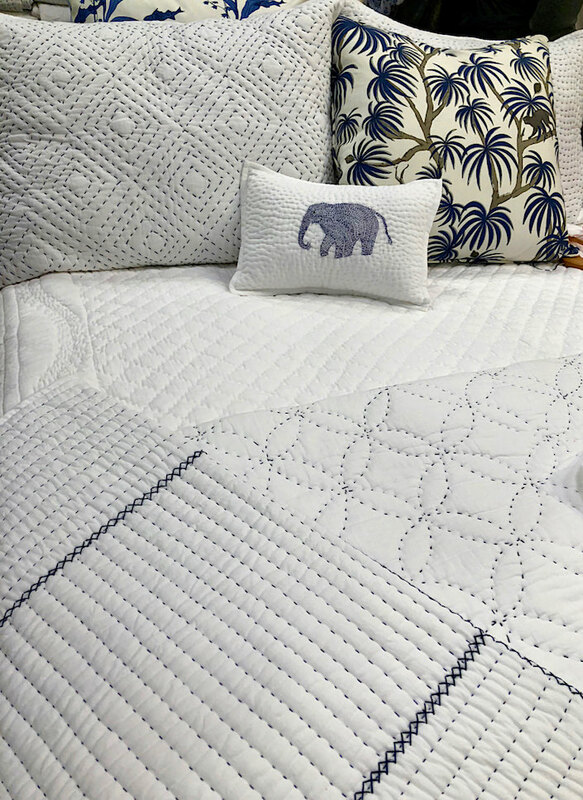 The new Ura duvet and Khata bolster, below, with the charming Doni decorative pillow in front. and if you missed it, but sure to check out the At Home With video visit at his Connecticut country home. Australia was well represented at the show including long time favorite walter. 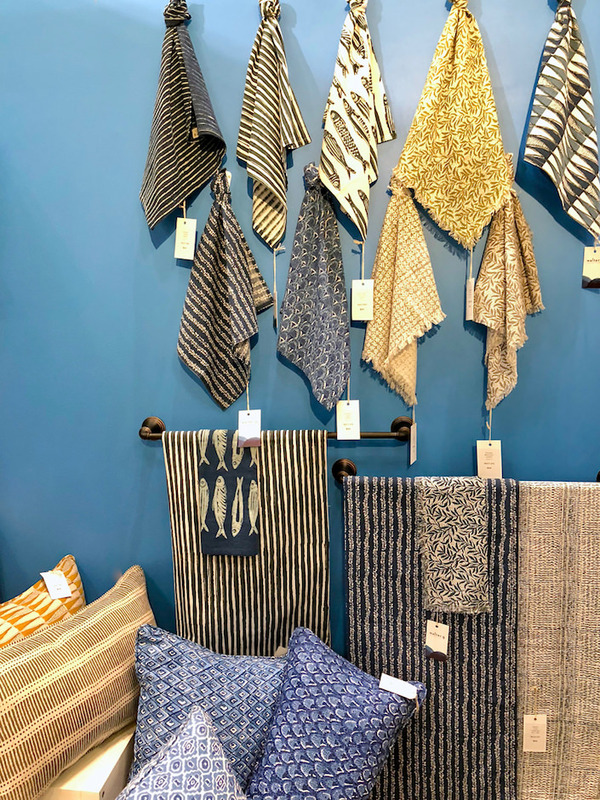 g. A boutique textile house founded by Lauren Emerson and Genevieve Hewson, they work with Indian artisans to produce their wonderful hand black and mud printed fabrics. 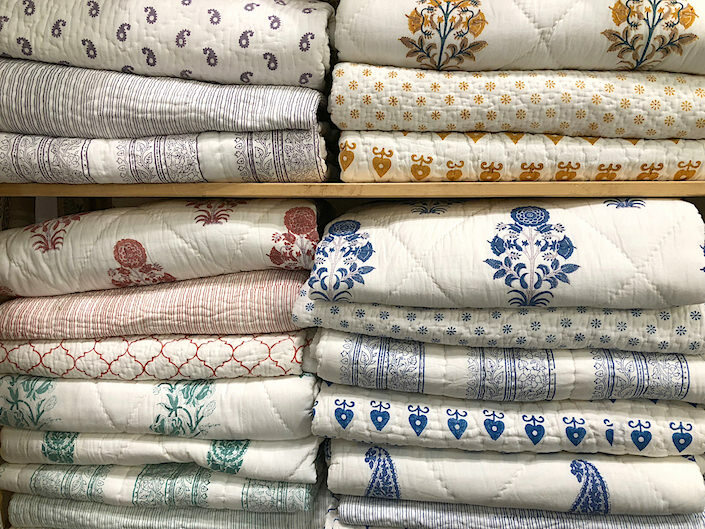 their pillows, table linens and quilts can be ordered directly from their site. 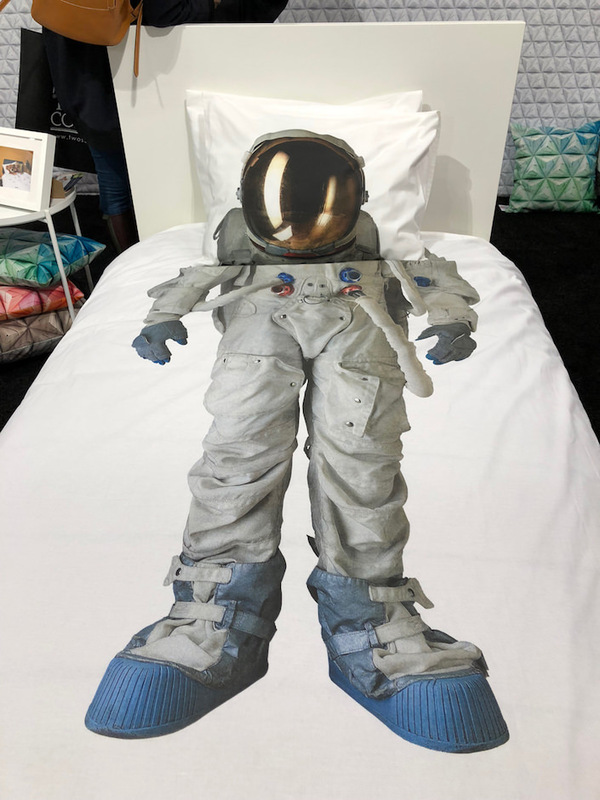 Utopia Goods produces hand screened linens celebrated Australian flora and fauna. 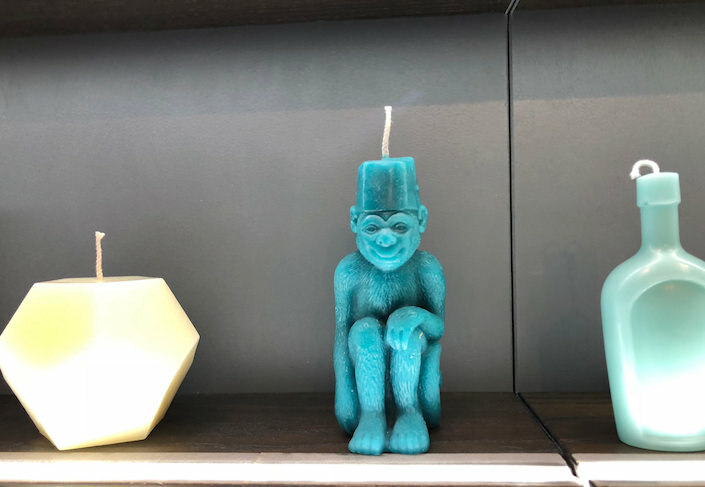 Designed by co-founder Bruce Slorach, they are “whimsical and wild,” referencing the Australian bush and historical influences with a modern style. 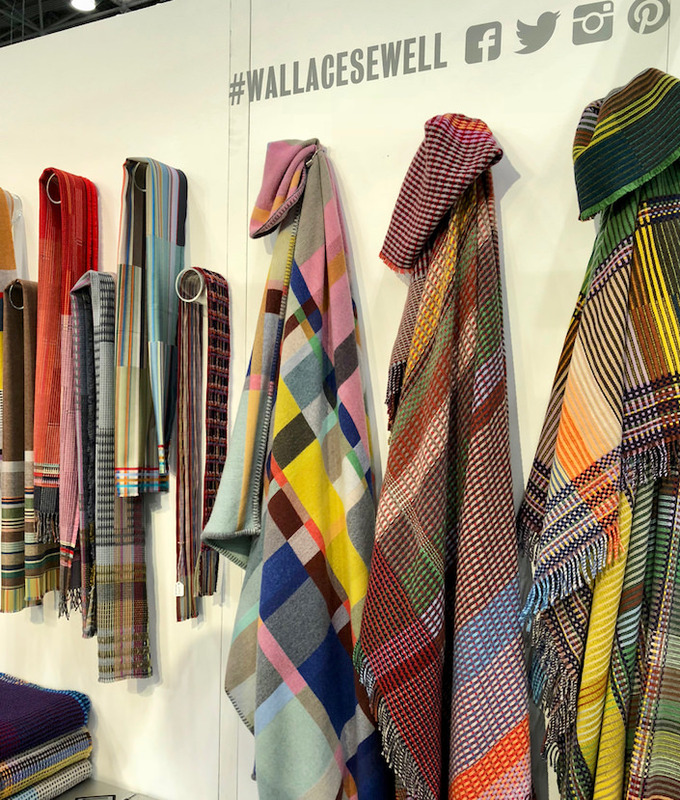 British brand Wallace Sewell produces colorful, creative, contemporary woven products, from scarves and ties to rugs, throws and cushions. 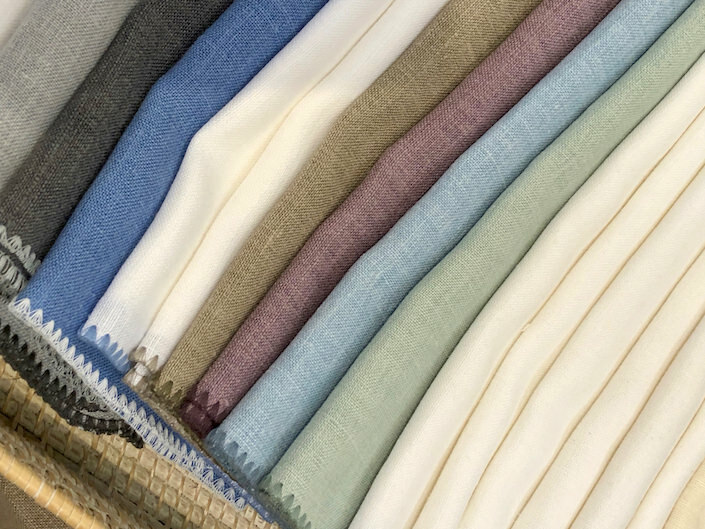 They are company melding craft tradition with modern day manufacturing. 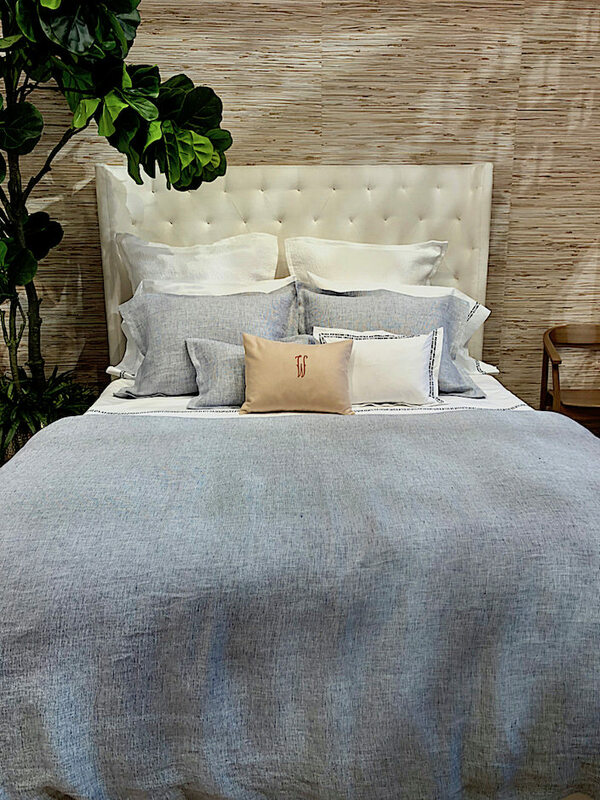 Their design process begins on handlooms and production is completed in a family-run mill that combines tradition with state of the art technology. They have a wide range of interesting collaborations and commissions, from the Tate to West Elm. 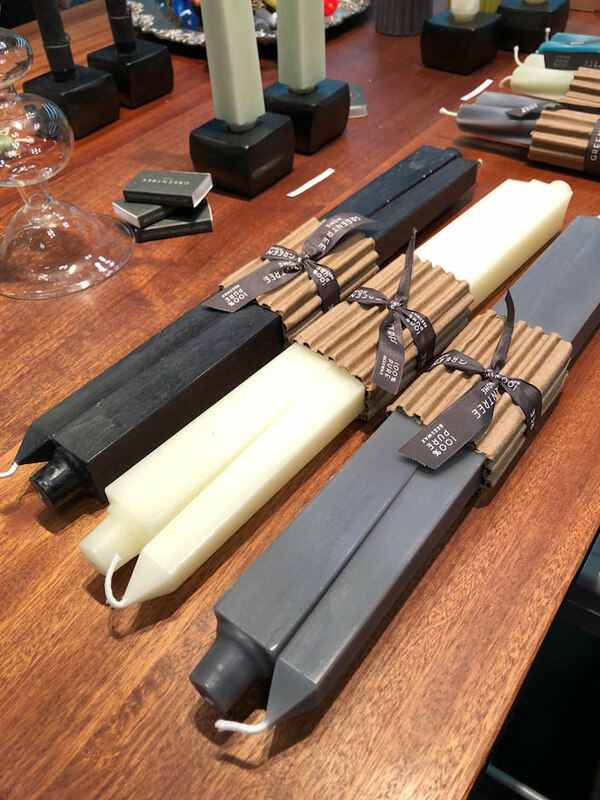 Entertaining is clearly an important aspect of the show and candles are an indispensible part of any venue. I love the square versions from Greentree. 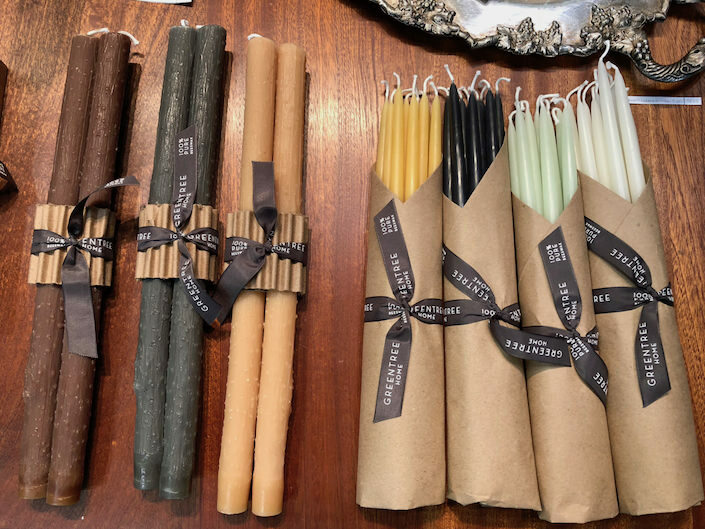 All handmade in the Catskills of 100% beeswax, they have a distinct artistic bent. 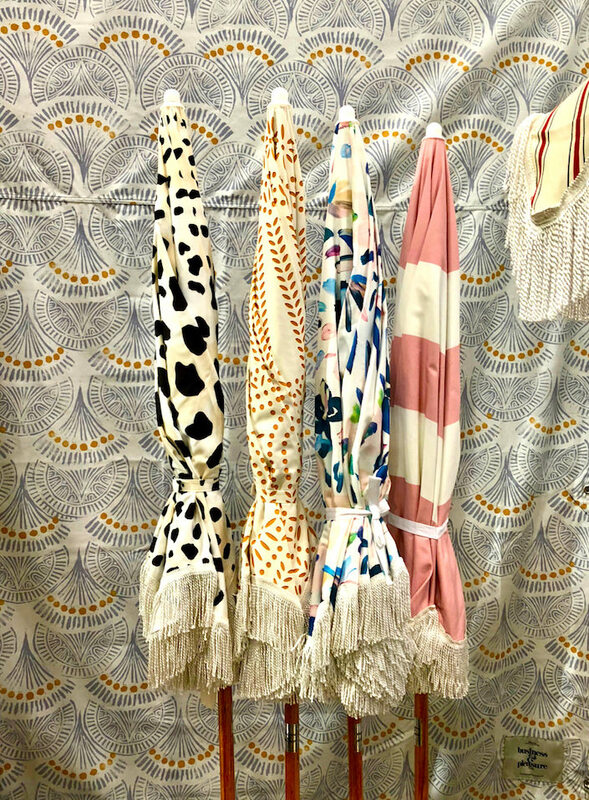 their collections also include whimsical was renderings of their favorite animals, geometric forms and many others. 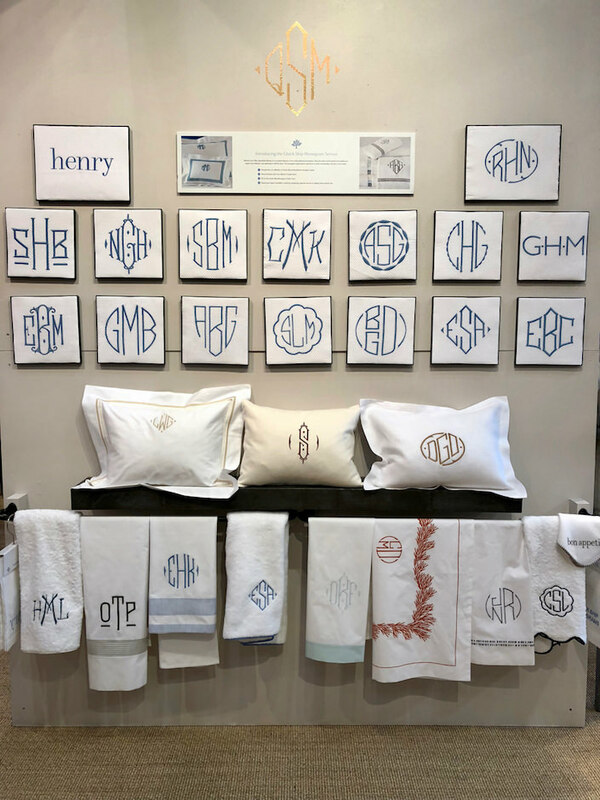 Also dedicated to the art of the handmade is Henry Handwork. 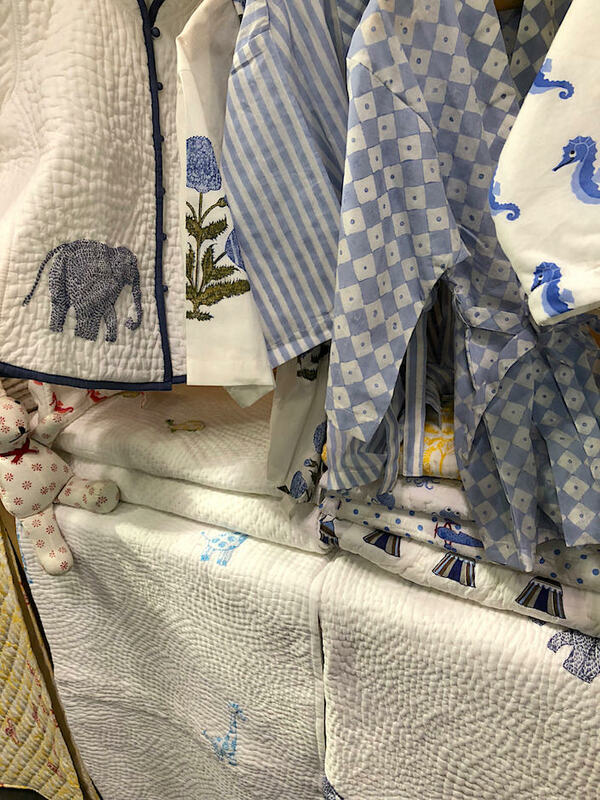 With an overwhelming booth filled with a wide variety of hand-embroidered products, it was difficult to choose one shot to embrace all they do. 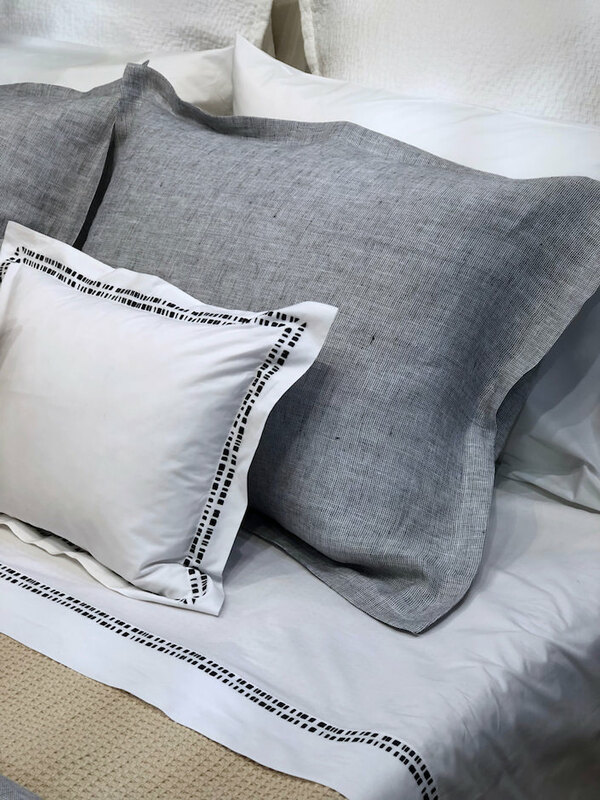 Preserving the traditions of classic needlework to celebrate contemporary living and occasions, all the products, from hand towels, cocktail and dinner napkins, estate table linens and more, feature hand-drawn trim and hemstitching on pure cotton or linen. 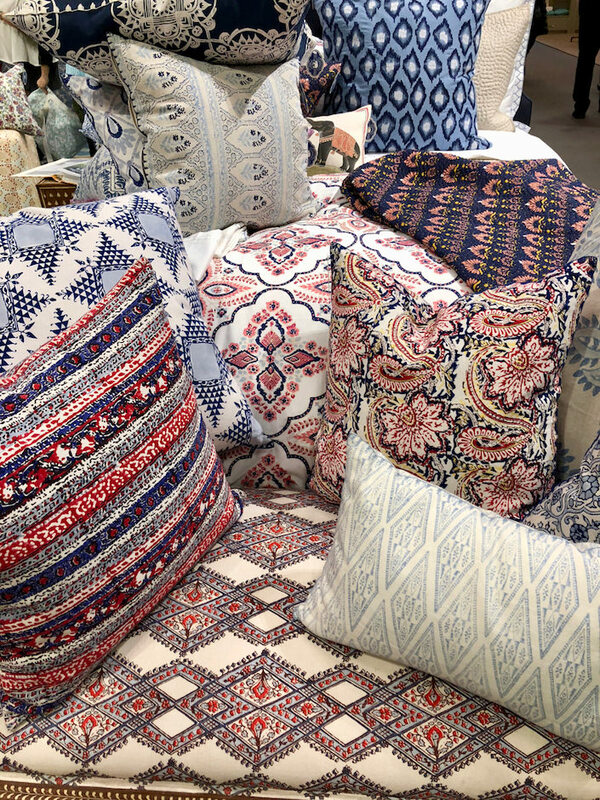 Since I clearly have way too much for a single post, please stop back Thursday for a stellar line up of more favorite finds from NY Now 2018 Spring. This entry posted in art, design, gifts, interior design. 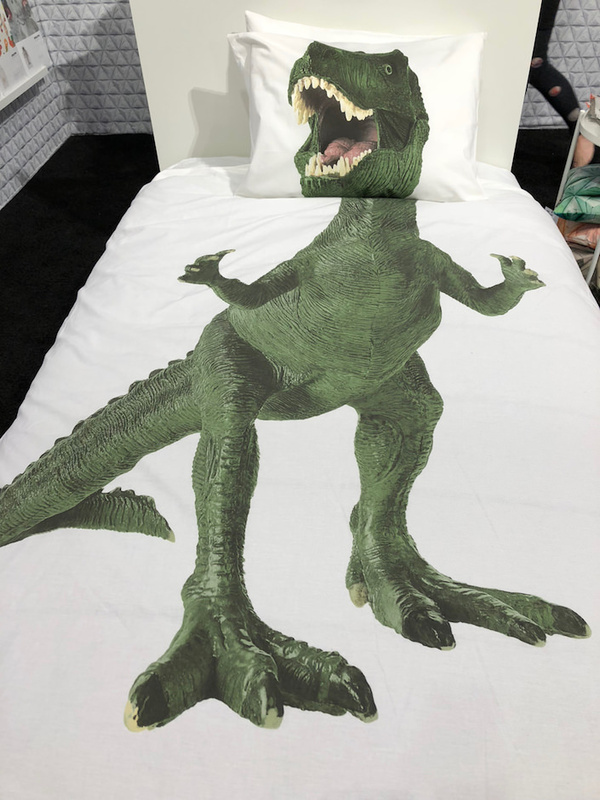 Entry Tags: accessories, bedding, Decorating, Design Shows, gift show, interior design, NY Now, NY Now 2018, Tabletop Bookmark the permalink. What a range of products and styles! 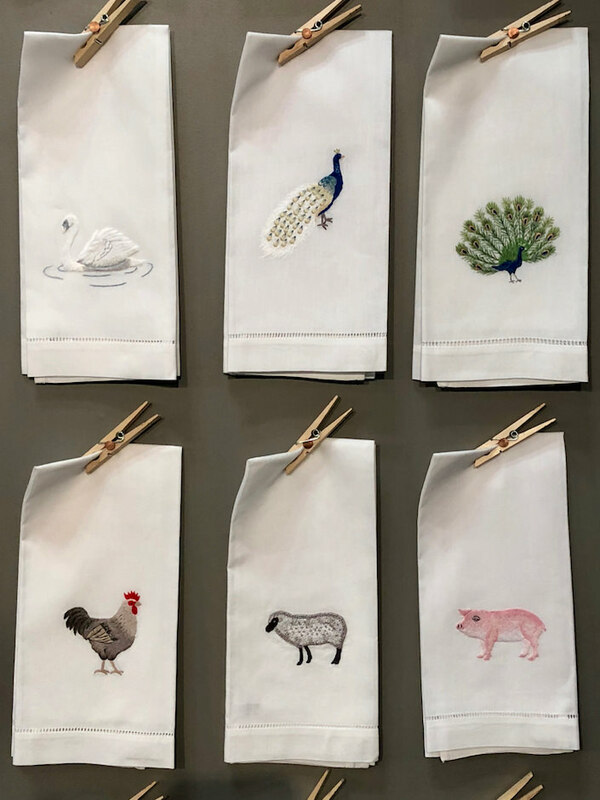 The hand-embroidered napkins are incredible–the work involved! 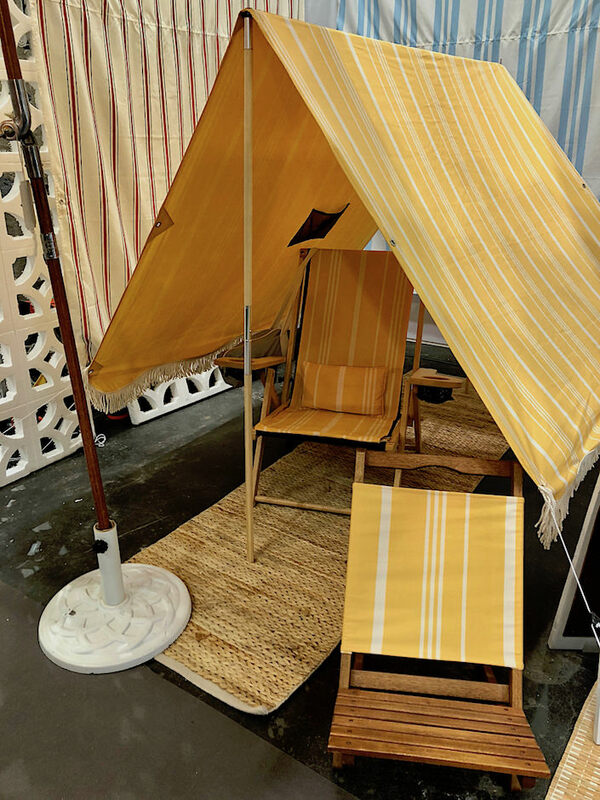 The beach tent is adorable, but it wouldn’t last a minute on the beach here–way too windy. Even umbrellas have a hard time. 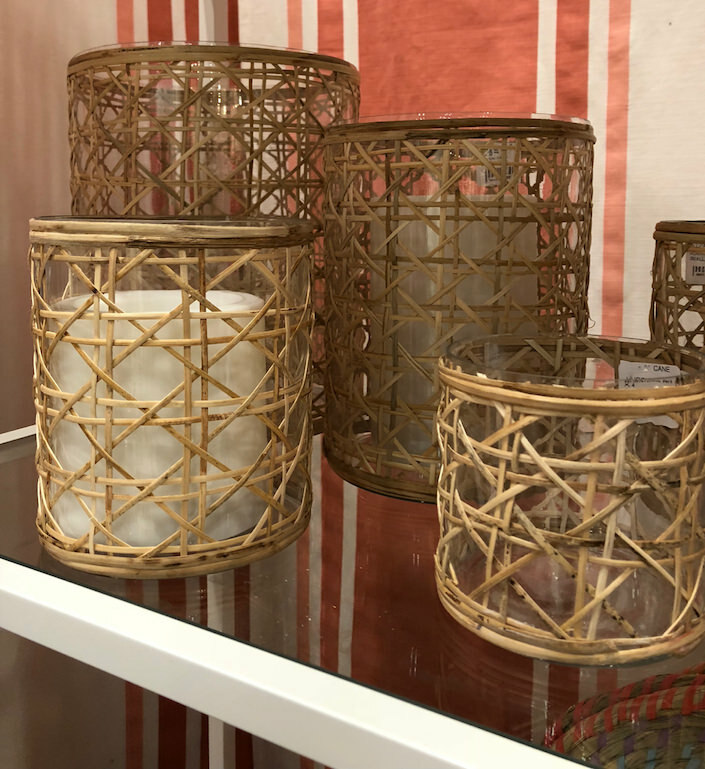 Love the chic new Matouk offerings! Thanks for the preview Stacey. The beach tent is a must!! In LOVE with the lanterns!! Thanks for all the fabulous resources!! Great post! Giving me a major case of Spring Fever. Delicious!